In addition to providing quality legal services, the firm is committed to making a difference in the local community. The span of philanthropy encompasses meal service, volunteering at events, painting senior citizens’ homes, food and clothing drives, pet supply drives, and a Santa for Seniors program. Whether employees are contributing time, money or resources, they are encouraged and rewarded. The firm’s “Give a Day, Get a Day” program provides up to eight hours of paid time annually for volunteer activities. 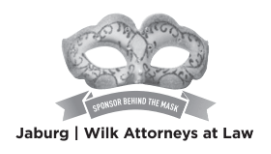 Knowing the need to financially support the passion and efforts of our employees, the firm formed the Jaburg & Wilk Foundation in 2007. Since then, it has granted more than $400,000 in supportive funding to local nonprofits. The foundation focuses on children, the at-risk population, and education in Maricopa County. MASK (Mothers Awareness on School-age Kids) fits perfectly with the firm’s initiatives. Raising children in the digital era provides new parenting challenges. We are very impressed by the educational resources that MASK provides to Arizona families.